Buy The Nerd Lys a Coffee. ko-fi.com/thenerdlys - Ko-fi ❤️ Where creators get paid by fans, with a 'Buy Me a Coffee' button. 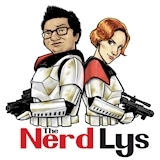 The Nerd Lys are Chris and Rachel Ly. A podcast with nerdy news and pop culture, and interviews with Creative People. We are available on Apple Podcasts, Soundcloud, Stitcher and any of your favorite podcast apps! Welcome to our Ko-Fi page. As always, donations are never required but if you would like to support what we do on the podcast and help us with some of our costs, we appreciate anything offered to us and hope to bring you new and relevant content as we continue to grow! If you donate, we'll give you a shoutout on our social media pages and on the podcast! Secured Payments. Support goes to The Nerd Lys's account. Upgrade The Nerd Lys to a yearly Gold Membership with a one-time payment.